elegant and chic ...they will love them. Wow well done you. I should say they will love them. Heck of alot of tiny amounts of gluing happening on those. Are you having a short break before doing the order of service and other bits? Too paranoid to have a break, Alison, just in case I leave things and then get ill again just before they're needed! Steve asked had Lorraine commented on the invitation and asked where the holly and ivy was, being that I only do Christmas! I think I would be the same, break the momentum and anything can happen. Waiting for Steve to ask where Stingray come's into it? Pmsl at Steve. It is gorgeous, Lynda. Really elegant. I wouldn't be able to rest until they were all done either Lynda, these are super. Is it a 20's wedding? Yes, Karelyn: a subtle 20s theme, I understand. 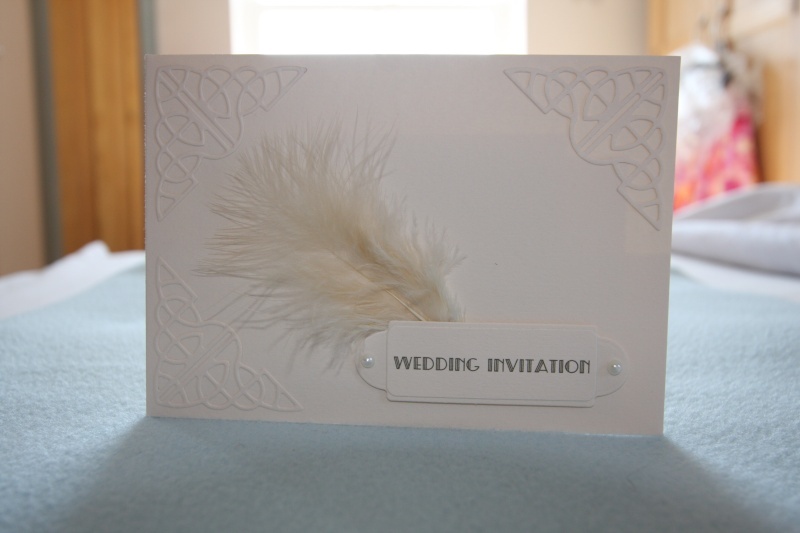 The bridesmaids' dresses have feathers on them, which is why Laura wanted feathers on the stationery.